MAJAZ LUCKNAVI: POET OF ROMANCE AND REVOLUTION! Two things have been common to a large number of Urdu Poets – drinking and unrequited love. Starting with Mir and Ghalib and going on to Sahir and Majaz, poets had a failed loved affair which became a major source of their poetic outpourings. I can think of only two major English poets who had an unrequited love-affair. One was John Keats whose failed love for Fanny Brawne is well-known. But even in Keat’s case their failed relationship does not become a major source of his great poetry. The other is W.B. Yeats, whose love for Mand Gonne made Yeats almost mad. He waited till the age of fifty one for Mand to say ‘yes’ to his marriage proposal. Only in Yeats’ case failed love became a source of his major poetry. Similarly, drinking and excessive drinking has been rampant among Urdu poets and has been the undoing of many of them. Jigar Murabadabi, Sahir Ludhianvi, Josh Malihabadi, Mirza Galib, Naresh Kumar Shaad, Adam and even Faiz Ahmed Faiz are the names that immediately come to mind in this context. Unfortunately, Majaz Lucknvi was a victim of both, unrequited love and alcoholism. 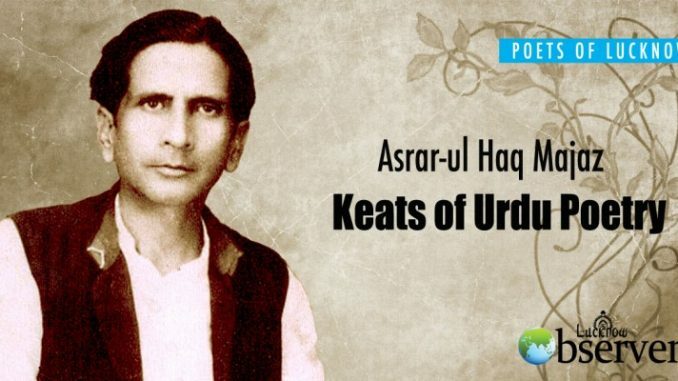 Asrar-ul-Haq Majaz Lucknavi was born in 1909, (some say 1911) in Radauli, Uttar Pradesh. His father Siraj-ul-Huq notwithstanding the fact that he was from a landed family, was the first person in Radauli who received higher education and took up a government job. Only at the age of 44 5th December 1955 he died and his pen name was ‘Majaz Lakhnawi’. Israr thus, belonged to family which while respecting old values of life aspired to be modern. And Majaz’s extended family, as far as art and poetry go, is indeed very impressive. He is the brother of Safia-who married the noted poet Jaan Nisar Akhtar and is the mother of poet and lyricist Javed Akhtar. Majaz received early education in Lucknow and moved to St. John College, Agra for higher studies. In Agra he met poets like Mueen Hasan Jazbi and Faani, Badauni. It was in Agrra that Majaz started writing poetry, the glow of which travelling through Aligarh and Delhi spread in the entire country. Majaz was so popular and his poetry such a rage hat, according to the noted Urdu writer Ismat Chuktai, the girls in the Women College, Aligarh kept his poems under their pillows and drew lots with Majaz’s name on them to find out who will marry him. They even thought of naming their sons after his name. Majaj took B.A. degree from Aligarh Muslim University and moved over to Delhi in 1936 where he got a job with All India Radio as the editor or their journal ‘Aawaz’. In Delhi, Majaz fell in love with a married woman from higher strata of society. But this woman would not or could not reciprocate his love; he felt heart-broken, left the job and Delhi and went back to Lucknow. It was this dejected mood that he wrote ‘Dilli Se Wapsi’. After leaving Delhi, Majaz worked for sometime in Bombay Information Service. Then along with Sardar Jafri and Sibte-Hasan, he edited a literary journal ‘Naya Abab’. Back in Delhi, he joined Harding Library as Assistant Librarian. In the meantime his parents fixed his marriage. However when things were looking up for Majaz, perhaps learning about his drinking and wayward life, they turned down the marriage proposal. This came as a proverbial last straw on camel’s back. As it happened in the earlier love affair Majaz completely lost his mental balance. He tool to heavy drinking and had a nervous breakdown. The girls who were at one time mad after him were now afraid of marrying a mad man. His parents had thought that once he got married, he would settle down in life like a normal person. They had with great effort somehow restored his balance. But not the rejection of the proposal by the girls father came as a bolt from the blue. After the second breakdown, he balances a megalomaniac telling people that he was the greatest poet after Ghalib and Iqbal. His family once again tried its best to bring him back to normal life, but to no avail. All his life, until his death in 1955, he remained an alcoholic. Sahir Ludhianvi who was himself a heavy drinker introduced Majaz in his journal ‘Savera’ as a vagabond who was always drunk. This is the ruin that failed love affairs brought on him. In Majaz’s drinking, his so called admires and fans played no small a role. Besides being a poet Majaz was great conversationalist. His fans and admirers would take him to their house or a tavern where they plied him with alcohol and enjoyed his brilliant conversation and recitation of poetry. It was at one such gathering that after making him drunk heavily they left for his houses, leaving Majaz intoxicated on the terrace of the tavern where he froze to death in cold winter night. And in the same poem Majaz compares the pale moon to a youthful widow. Both Majaz and Keats were poets of love and beauty. Besides their failed love affairs, both Keats and Majaz died relatively young. Keats lived only till the age of twenty six years. Both were romantic poets thought, the presence of realism in their poetry distinguishes them from other romantic poets. In the Ode to Nightingale itself, Keats writes. However in Majaz’s days Marxism was at its peak whereas Keats could not obviously have heard of it. His realism is the realism of life in general and not socio-economic-political realism. And this is a very big difference between the two poets. Majaz has a great respect for and hope for women, Rather than growing cynical about women because of his personal experience, he considers them their equal and a comrade-in-arm in the task of social change.